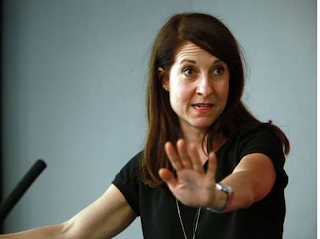 Time was when Liz Kendall was thought of as a good choice to lead the Labour Party following the departure of Mil The Younger. The latest episode in her campaign suggests, instead, that desperation is creeping in and that she is losing ground not just to front runner Andy Burnham, but Yvette Cooper as well. And it was Ms Cooper that the Kendall team chose to target in an exercise that has interested only Labour’s detractors. What started off as an innocuous-looking blog at the HuffPost by shadow media minister Helen Goodman - “Why, as a parent, I’m backing Yvette Cooper as Labour’s next leader” - was seized upon by Ms Kendall’s campaign manager Toby Perkins as a sign that Ms Cooper’s campaign was indulging in dirty tricks - because, as his candidate did not have any children, it must have been a dig at her. The thought that Ms Goodman may equally have been suggesting that there were three candidates who were parents, but only one of them got her vote, was not allowed to enter. Perkins then went on the BBC Daily Politics to express his unhappiness, but not, you understand, to try and whip up publicity for a campaign which is not cutting through in the same way as Burnham’s and Ms Cooper’s. Unfortunately, with the certainty of night following day, all that Perkins’ exhortations have done is to play into the hands of the right-leaning press, who have taken the idea of disagreement and inflated it in short order into one of those Labour Splits that they so love to exploit. See, readers, you don’t want to vote for the rotten lefties, they’re all fighting like ferrets in a sack - you should vote for Young Dave instead! The HuffPost has, as one might expect, covered the story, as it started with them, but most of the attention has come from the right. The Telegraph set the tone: “Yvette Cooper, the shadow home secretary, has been accused of highlighting the fact her Labour leadership rival Liz Kendall does not have any children to win votes as the contest descended into acrimony”. Acrimony that was entirely of the Kendall campaign’s making. Over at the Mail, in an article which was published later than the Tel’s, but which uses the same wording in parts, the headline was “Labour leadership race gets nasty: Allies of Yvette Cooper accused of attacking Liz Kendall for not having children … MP wrote article backing Yvette Cooper because she is 'a working mum’ … Allies of rival Liz Kendall launched a furious attack on the slur today”. And then there is the piss-poor SunNation version: “#CHILDGATE HOTS UP AS KENDALL ALLIES ROUND ON COOPER OVER TACKY JIBE … Yvette’s camp accused of gutter politics as ally backs ‘working mum’ over childless Kendall”. The article also carries a quote from a pro-Cooper MP: “It’s clear some around the Kandall campaign are intent on creating divisions and rows in the hope of lifting her campaign”. But all it’s done is get the right-wing press baying “Split”. Well done Toby Perkins. My money's on Burnham - for no other reason than somebody has to lie on the barbed wire. He'll be a loser of course. Eventually so will all New Labour. It's all they deserve. What REALLY matters is the restoration of founding principles and a sense of decency. Everything that went when Blair and his gang of right wing traitorous scumbags took over. There's a long, long way to go yet. To paraphrase Tony Stark, we don't need someone to lie down on the wire; we need someone to cut the wire.